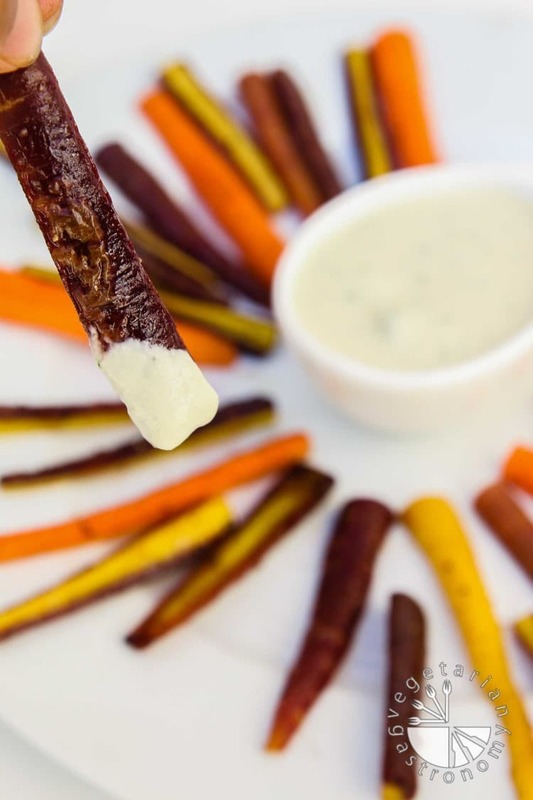 These Simple Maple Roasted Colored Carrot Sticks are addicting… and that’s an understatement. The past few months, I’ve found myself roasting a bunch of veggies during the day in the oven and calling it lunch. I mean I’ve always loved roasted veggies, but when you find yourself craving them on a weekly basis, you know it’s become an addiction! And when I mean roasted veggies, I mean any and all kinds…mushrooms, potatoes, broccoli, carrots, and peppers. It’s super easy. Simply chop up your veggies when you have a few minutes, toss them in some seasoning or even just salt/pepper and a little olive oil one vegetable at a time, throw them all on a lined baking sheet separated, and roast until tender. The oven does all the work for you, and they come out tasting delicious. I typically can’t even wait until they are all done and end up devouring them hot straight out of the oven as I pull them out one after another. One particular vegetable I can’t help but grab a bag of every time I’m at the market is colored carrots. 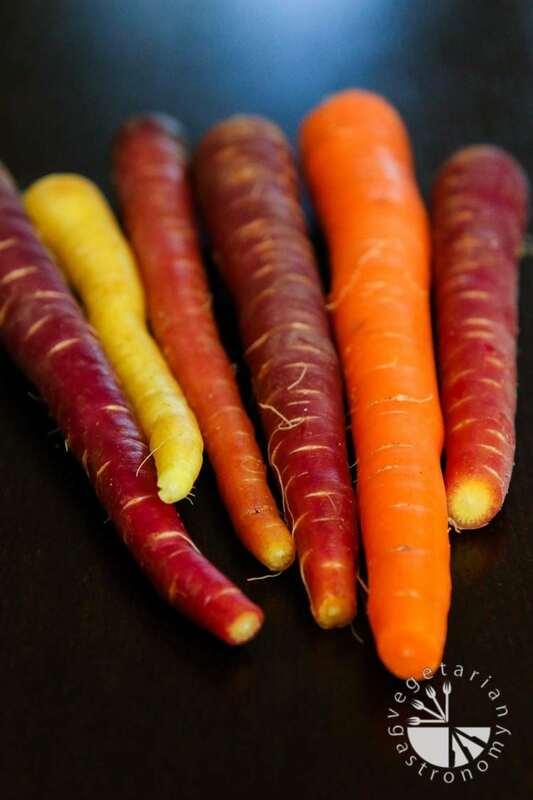 Have you ever had colored carrots before? Purple, white, yellow, and orange…they are awesome. I’ve had them in the past (mostly at restaurants), and typically always carry orange carrots in my fridge, but never really thought to buy a bag of colored carrots from the market. One day I decided to roast them and could not stop eating them. Even though this recipe is so simple, I crave these carrot sticks on a weekly basis, so I had to share it with all of you. Just try them, even if you’re not a huge carrot fan. 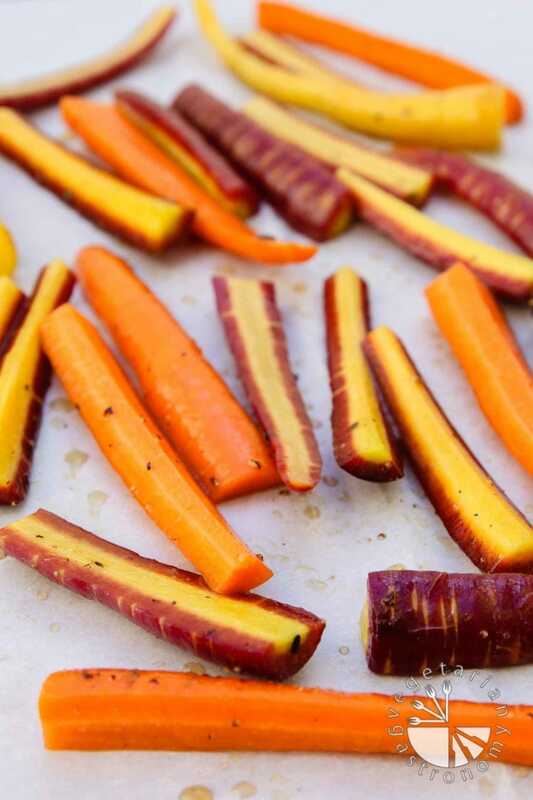 Buy a bag of colored carrots, try this recipe, and I guarantee it will turn you into a carrot lover. I typically enjoy them as is, roasted and hot right out of the oven, but I’ve also dipped them in my Vegan Cucumber Ranch Dressing and the combination tastes amazing. My kids devour them after school or whenever I make them as a dinner side. 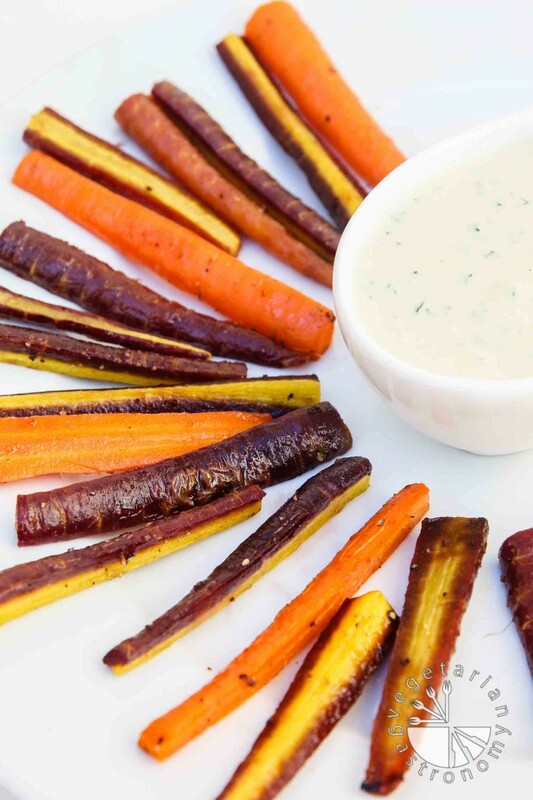 This won’t be the last time you’ll see colored carrots being used on my site, but for now, I simply can’t get passed this recipe. So give it a try, and let me know what you think in the comments below. It's the only way to devour carrots! These maple roasted carrot sticks are a crowd favorite and the perfect vegetable side dish! Trim the tips of the carrots, scrub the outsides with a knife if needed, and slice into sticks. Depending on the size of the carrot, cut in half width-wise, then cut each section lengthwise once or twice depending on the thickness. Basically they should end up like long sticks (see pictures above). Place all the carrot sticks in a large bowl, and toss with olive oil, maple syrup, some freshly ground black pepper, and sea salt to taste. Note that you can always add more sea salt and black pepper if needed after they are roasted in the oven. Line a baking sheet with parchment paper. 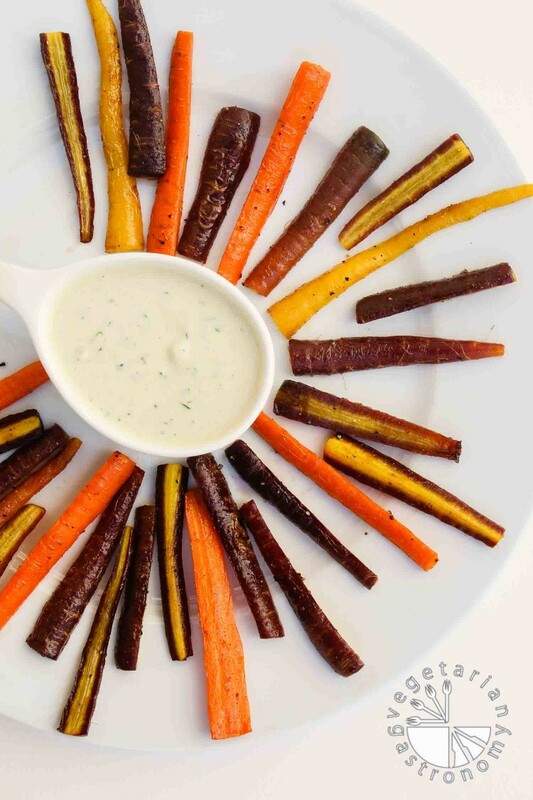 Arrange the prepared carrot sticks on the parchment paper in a single layer. Place in oven once preheated, and bake for about 20 minutes, or until the carrot sticks are tender and roasted. Remove from the oven and enjoy! Feel free to sprinkle on some extra sea salt or freshly ground black pepper if needed. Eat them plain right out of the oven, or dip them in some of my Vegan Cucumber Ranch ! Thanks Rashmi!! The flavor of veggies really comes out when they're roasted. I don't think I've gone through this many carrots in my life, but I just can't stop eating them! =) what's your favorite roasted veggie? Not at all...i JUST devoured another 6 carrots yesterday for lunch ha! I need to roast more corn as well...did it a lot when we were young but it's been awhile. Oh and roasted potatoes? Yeah...love them. which is why I stopped buying tons of potatoes ha! Thanks Reshana! It was really fun to photograph them since they were gorgeous. 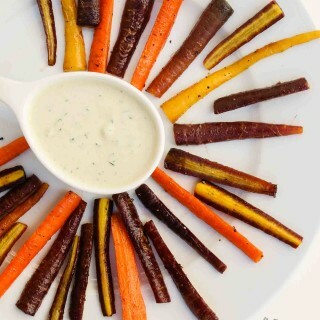 Oh yeah colored carrots are awesome. The purple ones are probably my favorite. These are so beautiful Anjali! I love the simple recipe and having it with the ranch is a wonderful idea. I absolutely LOVE roasted carrots! I kid you not, I nearly consider them dessert because I can eat an entire bag of them roasted, I love how sweet and delicious they become! They look amazing. Aww thanks Brandi! So honored to have you on my site!! I honestly just recently realized how delicious roasted carrots really were! I know right...took me long enough, and now I can't stop devouring them every week. Especially the bag of colored carrots. I typically eat them as is right out of the oven, but whenever I have a batch of my ranch in the fridge, I can't help but dip them in. Thanks again Brandi! Such beautiful colors! How can u not devour the plate!